Gov. 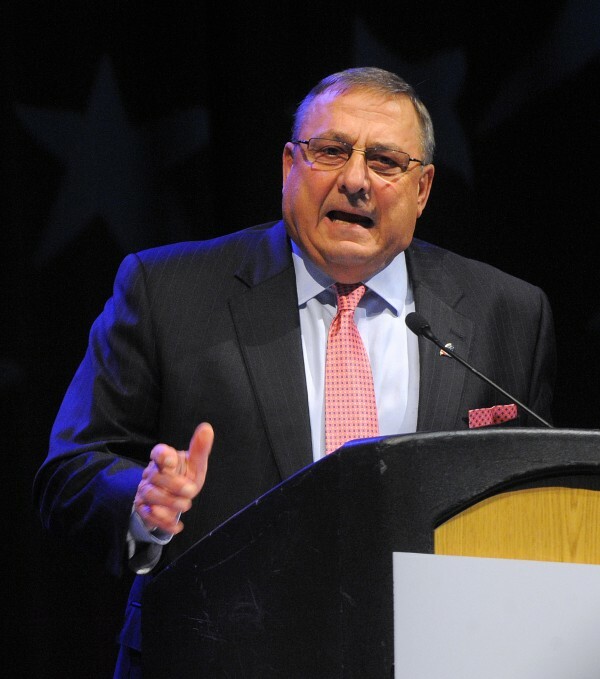 Paul LePage speaks during the 2014 Maine Republican Convention. AUGUSTA, Maine — The group with alleged ties to domestic terrorism that met eight times with Gov. Paul LePage in 2013 consists of four Maine men who believe their constitutional rights have been violated. The little-known Maine Constitution Coalition was thrust into the state and national spotlight Monday when Mike Tipping, a Maine liberal activist, detailed the group’s numerous meetings with LePage last year and alleged their connections to a national group classified as domestic terrorists. Merletti and his colleagues on the coalition take their definition of what those rights are from a strict interpretation of the original U.S. Constitution and the unamended version of Maine’s constitution from 1820. They strongly defend property rights — including that property owners are justified in shooting trespassers — and claim that county sheriffs should be the state’s top law enforcement officials, that constitutional amendments are “repugnant” and that the nation’s monetary system has been invalidated. Merletti said the coalition is less of a formal organization than it is a group of like-minded constitutionalists who are operating mostly independently of each other, though toward similar goals. Each of the four core coalition members pursue various topics on their own with the help of researchers who in some cases hail from across the country. Two other members of the Maine Constitution Coalition, Wayne Leach and Gary Smart, also told the Bangor Daily News on Tuesday that their group has no links to violent confrontations across the country that have been carried out in the name of a movement called the Sovereign Citizens. The coalition’s fourth member in Maine, Jack McCarthy, whose comments on a talk radio show provided some of Tipping’s fodder, could not be reached for comment. At issue are some 16 hours of meetings coalition members had with LePage in 2013. Tipping, a communications director for the Maine People’s Alliance whose blog is hosted by the BDN, has written a book called “As Maine Went: Governor Paul LePage and the Tea Party Takeover of Maine” that asserts the coalition has ties to the Sovereign Citizens, which the Federal Bureau of Investigation and Maine State Police consider part of a domestic terrorist movement. The yet-to-be-published book is being released in chapters and Tipping is running an online fundraiser for promotion of the book, which is set to be published by Tilbury House Publishers of Gardiner. Coalition members argue that government leaders — specifically Maine House Speaker Mark Eves and Senate President Justin Alfond, both Democrats — have violated the intent of the U.S. and Maine constitutions, which they construe to be treason. Though coalition members say it is not their intent nor have they suggested it, treason is punishable by death. LePage denied that execution was ever discussed and said he didn’t agree with much of what the coalition members discussed with him. Smart said the first goal of the coalition is to draw elected officials into a conversation about its remonstrances, which are documents they say make the case that the constitutions have been violated, but that so far, LePage is one of very few political leaders who have engaged. Neither Smart nor any of the coalition members would identify which lawmakers have conversed with them because they feared doing so would erode support for their cause. Both Leach and Merletti said they remember at least one discussion with LePage about treason but did not recall any mention of execution. Tipping cited documents he obtained from the governor’s office through a public records request and McCarthy’s northern Maine radio show that aired shortly after one of the meetings between LePage and coalition members. He also linked the group with some radical beliefs, including that there is a brewing holocaust against Christians and that the Sept. 11 attacks, the Boston Marathon bombing and other mass shootings were staged by the U.S. government. In addition to their research and filing remonstrances, the group is circulating an online petition that supports its goals. As of Monday afternoon, the petition had 212 signatures. They coalition is also hosting a series of symposiums across Maine, two of which took place last week in Houlton and Presque Isle with between 20 and 25 people in attendance at each event. Two more symposiums are scheduled for July 26 in Hampden and Aug. 9 in Chelsea. Members of the coalition said they are being caught in the middle of a political attack against LePage in an election year. Tipping told the BDN on Monday that he stands by his reporting and in a blog post Tuesday reiterated that execution for treason was a topic of discussion between LePage and McCarthy.